Today is the final day of this Seoul/Tokyo trip, as I head towards Akihabara on the JR Yamanote line, I can see from the train windows that clouds are crowding over the city sky. Actually thinking back on it, every single time I’ve traveled overseas, the weather has always been perfect no matter where I went. This is the first time it’s been cloudy. Good thing is, today’s plans are mostly indoors. 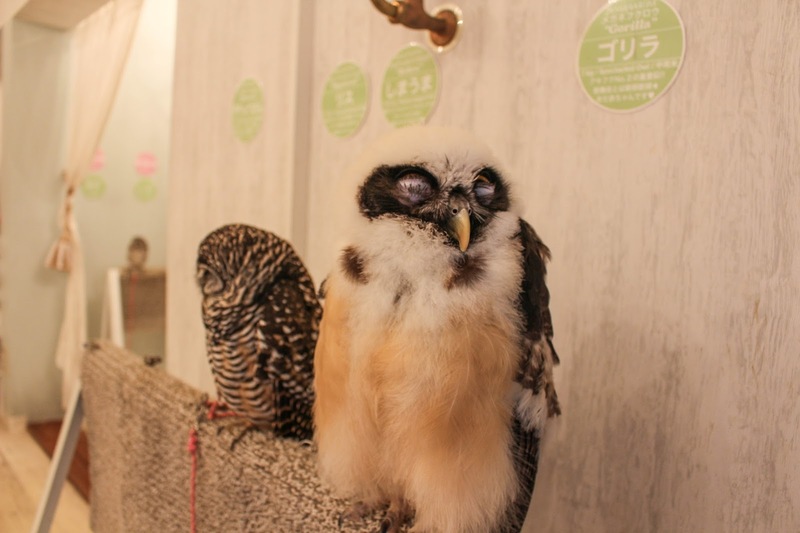 First some shopping at Yodobashi Camera, the Owl Café, and then some late lunch before I head towards the airport. The train pulls up at Sugamo station and I see 2 mothers with 5 children accompanying them. They were all around the ages of 5-7, pretty young. Now if this was in other countries, most likely you will be stuck in a train full of screaming little creatures running around, spinning around poles, and disturbing everyone they can. Not cute. 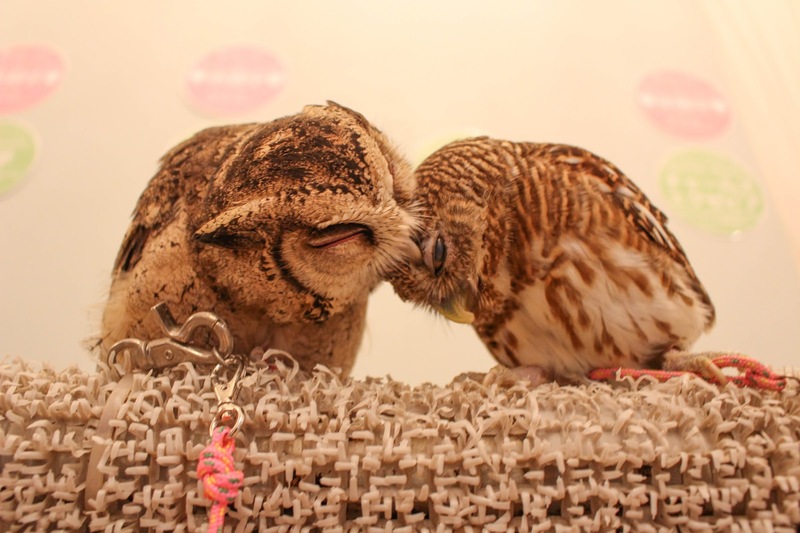 But this is Japan, and one of the reasons I love Japan so much is how well-mannered people are, no matter the age. EDUCATION SUCCESS, WELL DONE JAPAN. In the case of certain other countries, even adults are shouting across trains, pushing and shoving people. I’m sure you don’t need me to name the country; we all know which ones they are. 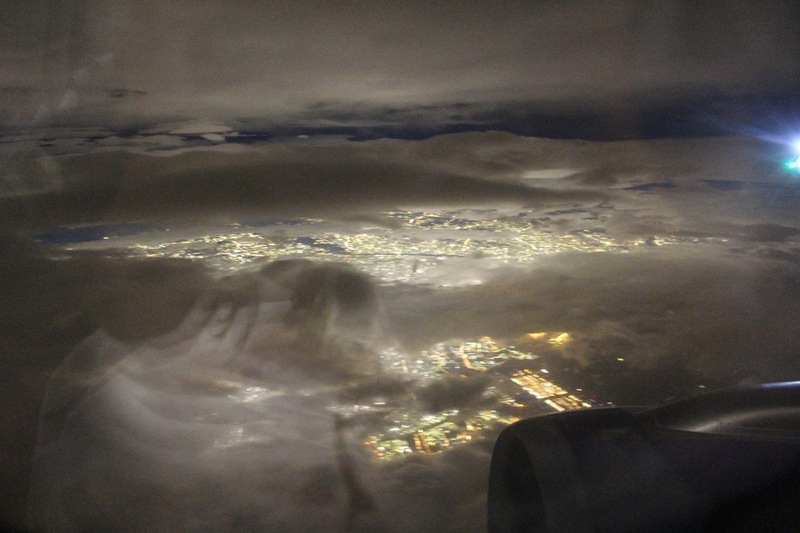 This is why even though Japan is densely populated; it is still very pleasant to travel here. I actually get to relax and not have to worry about people elbowing me while walking or shoving me into a train, or shouting at my ear. If anything, I wish that the way Japanese people educate their children about etiquette, manner, and behavior can be adopted globally in all schools. 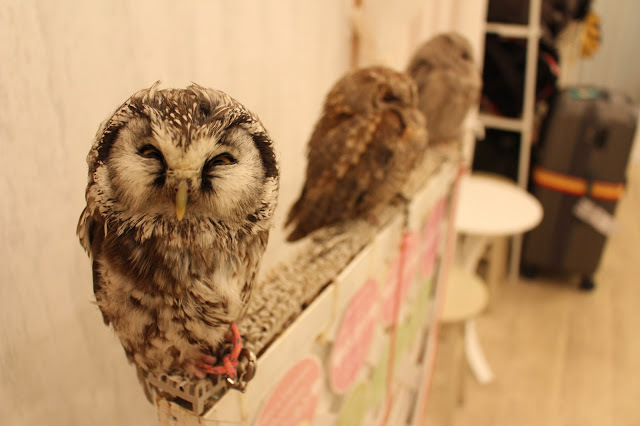 The owl café looked like a cozy bedroom with dim yellowish lights and homey decorations. 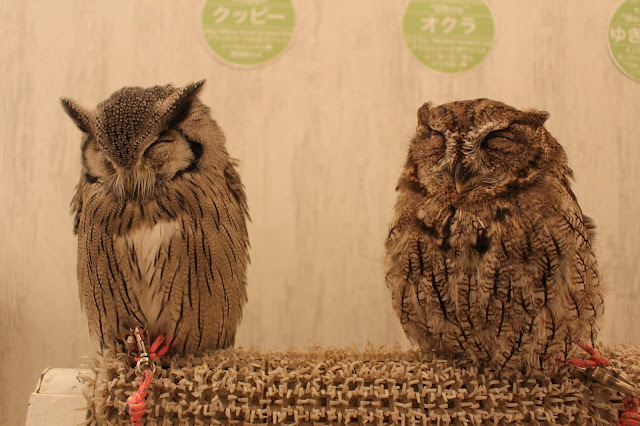 It was very quiet and everyone was very polite and respectful to the owls. All you could hear are the hooting of different owls and their wings flapping if they were flying. Upon entering you must pay the entry fee in cash only. Then they give you hand sanitizer. You are allowed to take photos and touch the owl’s foreheads. Certain owls will have a sign indicating that they are “resting” or “on vacation”, for those owls you are asked to kindly leave them be. 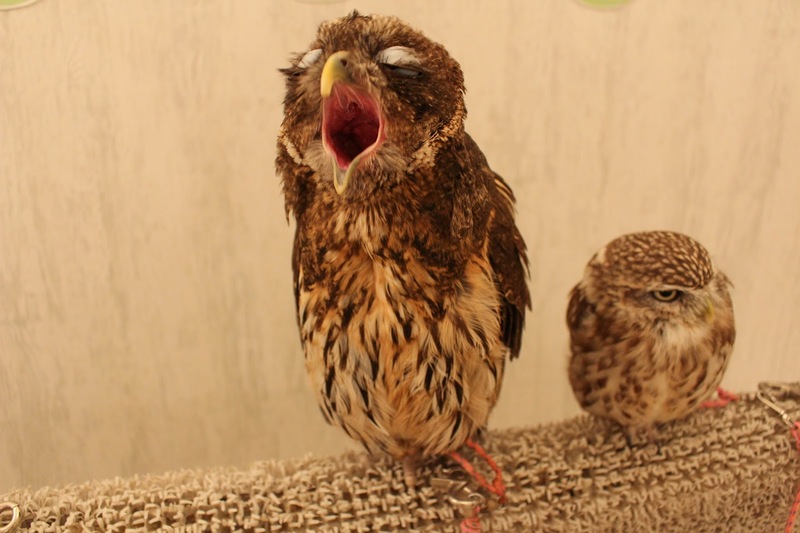 They had anything from a palm sized tiny owl to something that’s too heavy to carry. 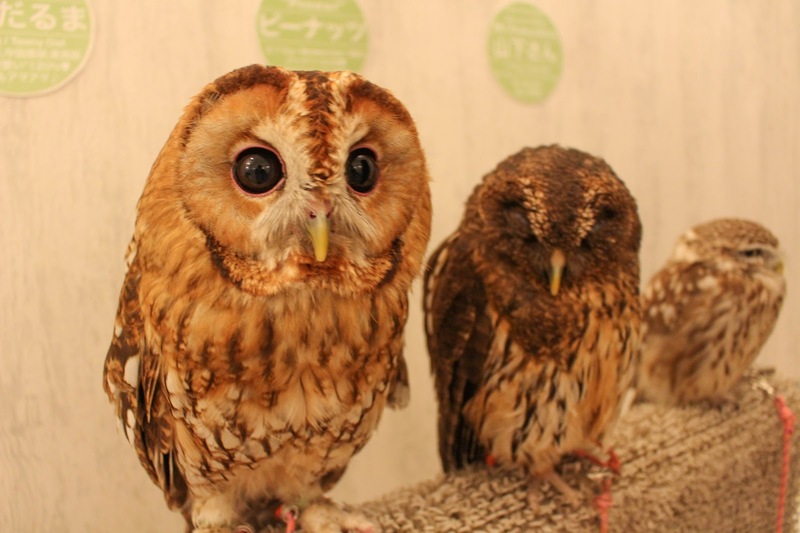 If you would like to carry any of the owls you can request the staff to help you. 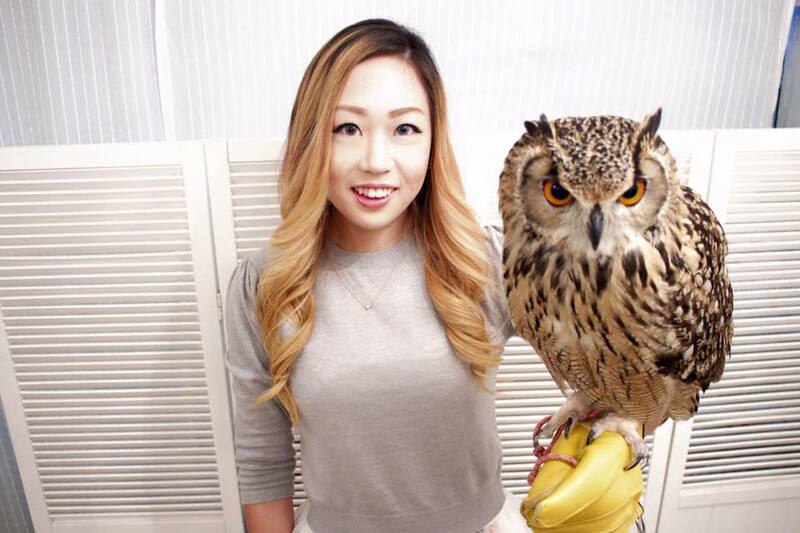 With bigger owls though you do have to wear a glove so they don’t scratch your hands. 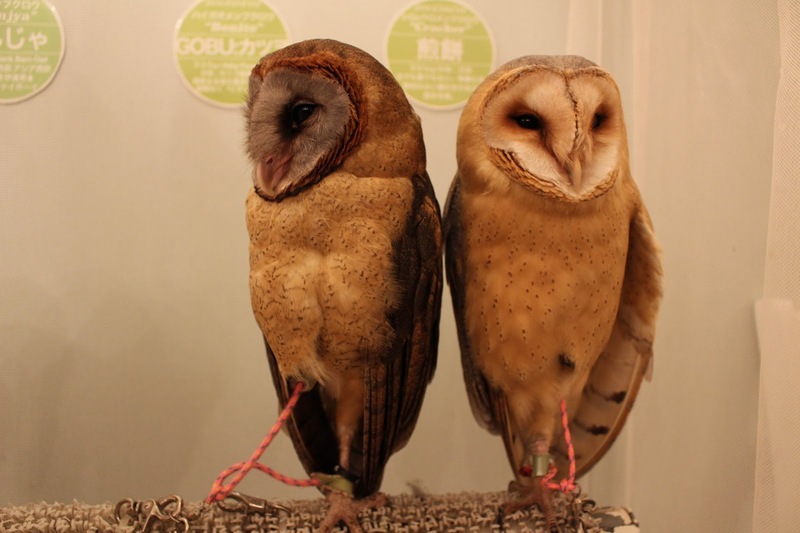 Each owl has their own name as well as the weight in grams and the species labeled directly behind them. 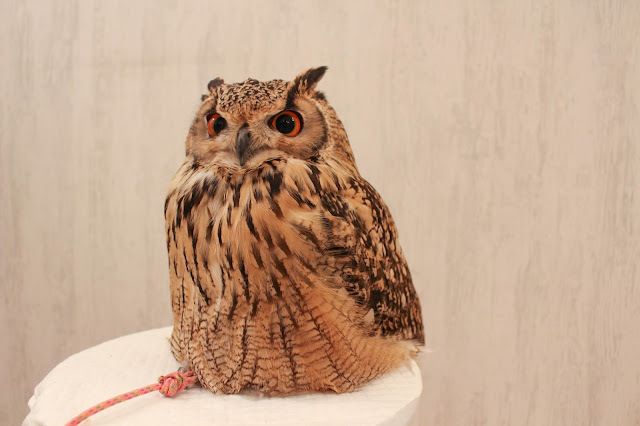 For the photo I choose a really big guy called Negi “Spring Onion” and he was a Rock Eagle Owl that weighed a whooping 900g. Rock Eagle Owls are found in the Indian sub-continent and the Himalayas. He has these really big eyebrows making him look like he’s angry all the time! After holding him for the photo, I sat down for 3 minutes and was ready to put him down. 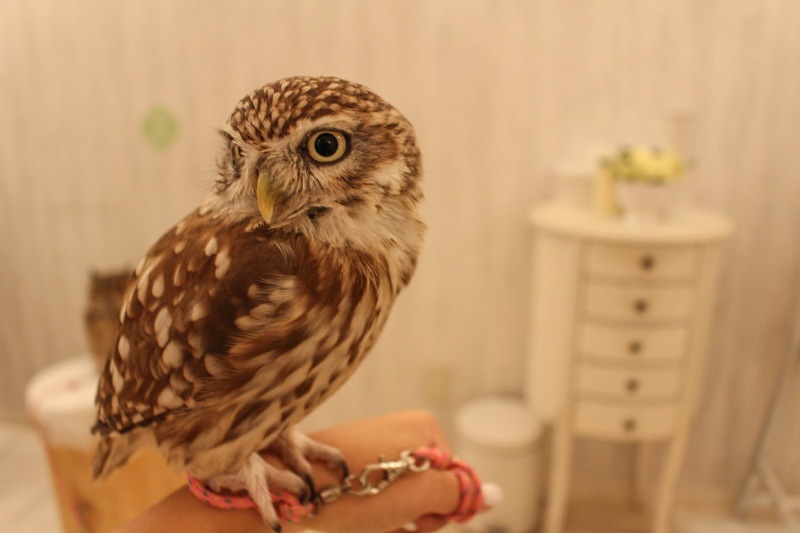 Next I went for Mr. Yamashita, which was a Little Owl of only 160g. 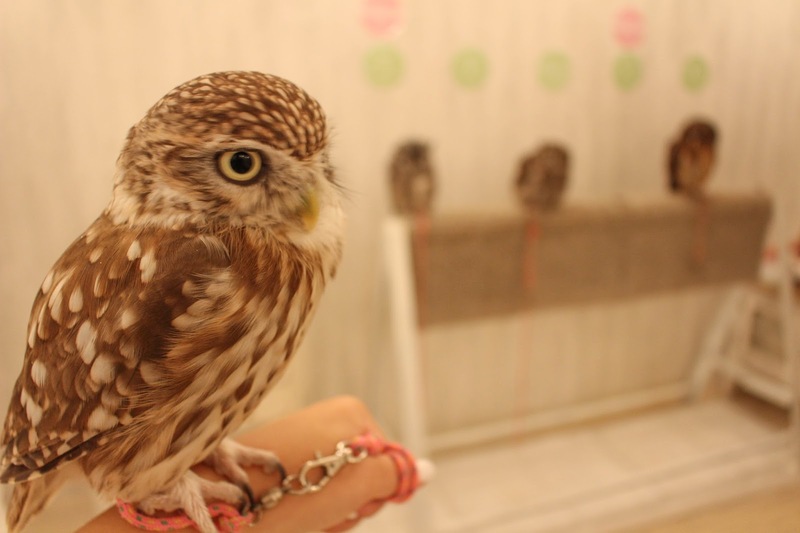 Little Owls can be found in Europe, East Asia, as well as North Africa. He was the perfect size for selfies! And he was also a very curious and energetic little one. He kept looking around the room and I managed to get some amazing shots of him. 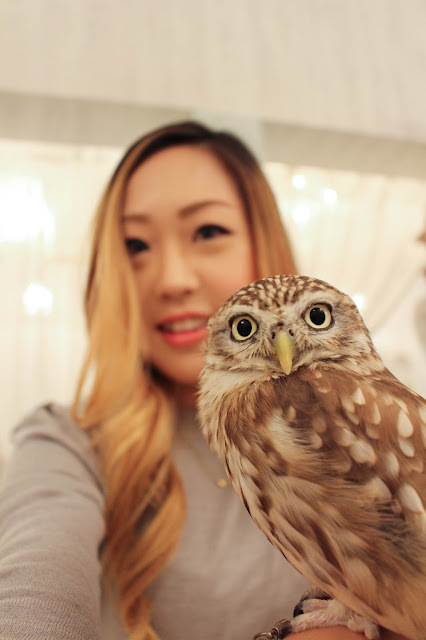 Except he managed to poop on my skirt, but it was waterproof and there were wet wipes so it didn’t stain. I’m definitely ready for Hogwarts now, can I apply? If you walk around in Akihabara, you will see a lot of girls dressed in maid outfits calling out for you to visit their café. Maid cafes are popular in Japanese culture, and mainly target towards the anime and manga lovers. In those cafes you order food and drinks while being served by girls dressed in maid outfits. They will also address you as master and use extra polite language. If you see them hanging around on the street though you are not allowed to take photos of them because this takes away the business and the point of dining at a maid café. 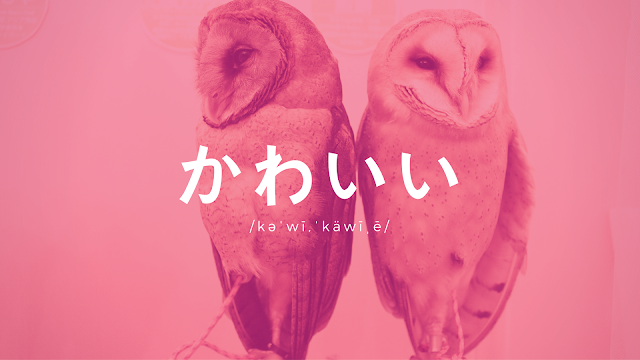 I’ve asked a girl politely in Japanese about this, which I’ve been confused for a long time about. So it’s not that they are stuck up, or reluctant, it was a business decision made by people running the shops. The direct opposite of a maid café are butler cafes, catered towards the female consumer obviously, but the concept is similar. 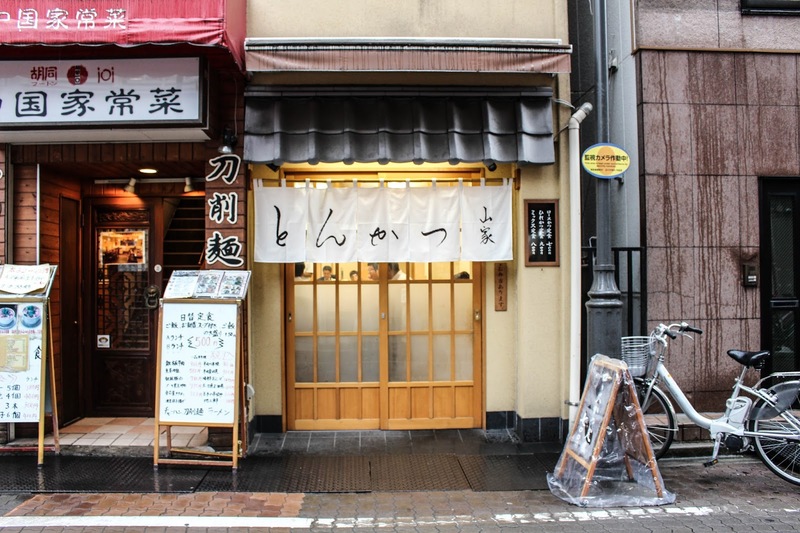 Other than maid cafes there are also some other specialty cafes. There’s a train café for people who love the tradition of Japanese trains where uniformed staff will serve you bento pushed out on a car. Other than owl cafes, you can also find dog, cat, and bunny cafes all over Japan. You can also get character themed cafes such as Hello Kitty, Gundam, Final Fantasy, Pokémon, Naruto and so on. 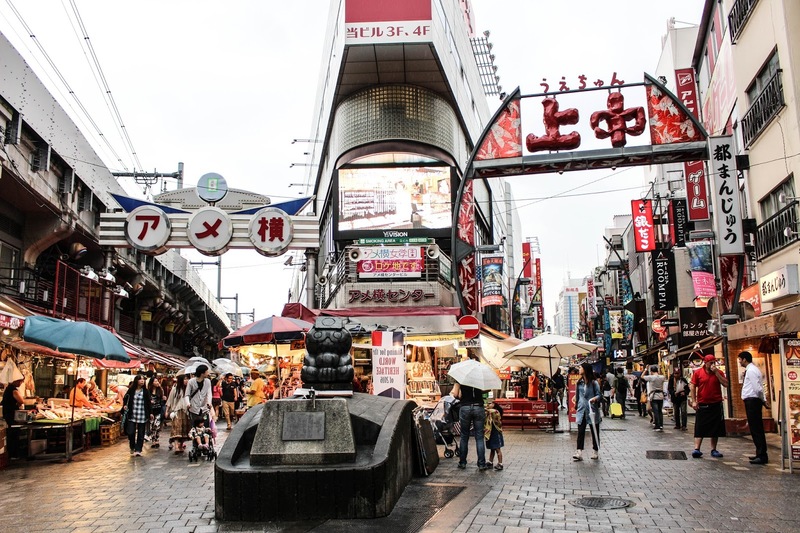 It depends on what you like and I’m sure Akihabara will be able to cater to your interests. Now time for a late lunch, as well as my last meal in Tokyo. I was recommended a Tonkatsu restaurant near Ueno Station. At this point the rain was getting pretty heavy so I decided to buy this unnecessary cute full-sized umbrella. It was definitely a good idea because I ended up wandering from Ueno to Okachimachi station. It took me forever to find the place because there are 5 subway/railway stations that are attached to the Ueno JR station. The place was called “とんかつ山家”. It was a small family owned place and the family name must be山家. It was a cozy place with one bar area and the kitchen was directly in front of the seats so you could see them make the Tonkatsu. I really wanted to film them making the food, but they kindly rejected me when I had asked. But the food was really delicious, definitely worth walking around lost for 30 minutes to find the place. It was still drizzling, and there wasn’t enough time to wander around in another neighborhood so I just headed to the Airport early to do some more last minute shopping. I first took the JR line to Nippori station and then transferred to the Skyliner train to the airport. 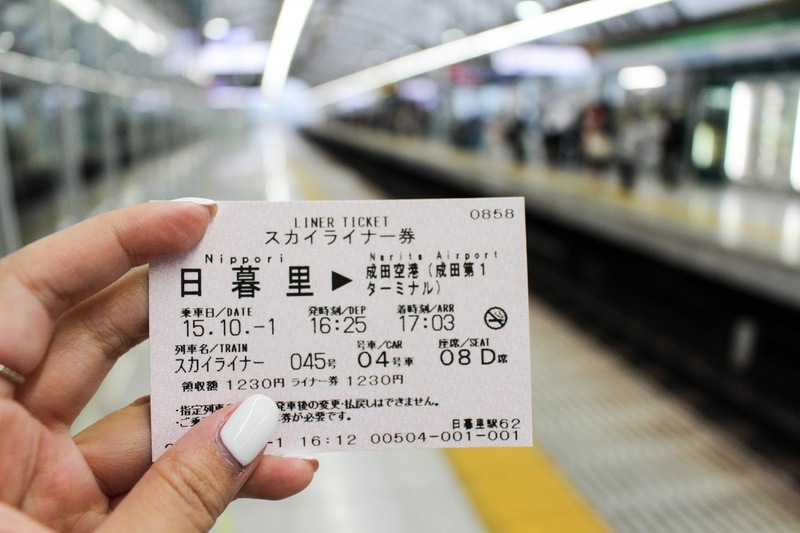 The assigned seat ticket was only ¥1,230! It took only 30 minutes to get to the airport. I was in terminal 2, but there were still a lot of souvenir shopping you could do! And I managed to pass security with a bottle of mosquito cream medicine somehow.